Check out Jeff Hall’s testimonial about his Magnum 27 Sport! This is a testament to Magnum quality. I will never sell this boat! If I do, I know I will regret it. I have enclosed pictures of my 27’ Sport The Hawk. It is hull #121 built in 1971. It was raced during the 1970s as The Hawk and was kept in the original configuration, which is quite rare for a boat of this type and age. Every time I tie up at the dock or throw out the anchor, people start to gather around to have a look. Hopefully they enjoy the classic lines and original styling as much as I do! 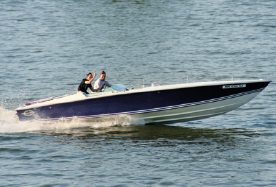 The original designers of this boat got the styling and performance right the first time. I believe it is the most copied boat I have seen; they always try to copy the best. It’s nearly forty years old and still flies like new. With decent care, it will easily last another forty.